While solicitor Simon McGarr says the two paragraph apology by The Irish Times on page seven of last Saturday’s paper was inadequate in the eyes of media regulations. THE PRO-LIFE Campaign says the story in The Irish Times that the first legal abortion had taken place at the National Maternity Hospital “raises major credibility issues” for the paper and said the recent apology is “inadequate”. On August 23, the paper reported on the front page that doctors at the hospital had carried out the country’s first termination under the provisions of the Protection of Life During Pregnancy Act 2013 – a claim that the Department of Health has refuted. 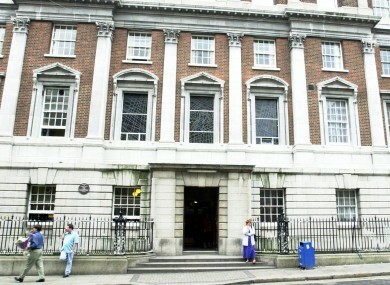 Obstetrician Dr Peter Boylan, Clinical Director at the Holles Street hospital was angered that patient details ended up in newspapers that could have revealed the woman’s identity. The hospital has since launched an internal investigation to discover the source of the leaked information. While there are rights to patient confidentiality, there are also rights for the public to know what is happening. And in this case, and in all the reporting by The Irish Times on this issue, over the last year and before, we’ve been trying to put out there what is in the public interest. When appropriate, a retraction, apology, clarification, explanation or response shall be published promptly and with due prominence. Where a complaint has been upheld in relation to an article published on the front page of a publication, the decision should be published with due prominence on one of the first four editorial pages. McGarr said The Irish Times instead printed a two paragraph “cryptic statement” on page seven of the paper, which he believes was inadequete. The Pro-Life Campaign have also come out against the abortion story and the “embarrassing admission” that “the case described in the article did not happen”. TheJournal.ie’s calls to The Irish Times for comment were not immediately returned. Email “Pro Life campaign: Irish Times abortion story 'raises major credibility issues'”. Feedback on “Pro Life campaign: Irish Times abortion story 'raises major credibility issues'”.